Brett Wightman in Iraq somewhere near Haditha Dam April 2, 2005. On Saturday, Nov. 10 at 8:30 a.m., there will be a 5K race in remembrance of Lance Cpl. Brett Wightman, who was killed while serving his country in Iraq on Aug. 3, 2005 at the age of 22. Wightman, an East Clinton High School graduate, was a member of the Lima Company out of Columbus. The Brett Wightman 5K/Walk & Fun Run was started as a day of remembrance. Proceeds from the race will go toward scholarships for East Clinton graduates pursuing higher education. 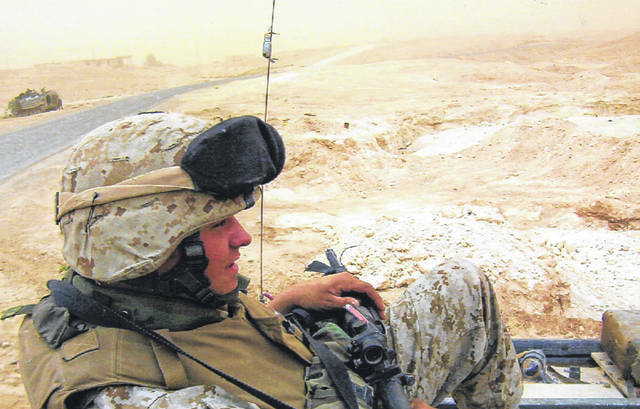 He aspired to be a Marine since his childhood and made his dream come true right after graduating from East Clinton. Many individuals, local businesses and veteran groups have come together to show their support for this race. The breakfast will be provided by Traditions and The Masons of Sabina, and will be served in the Sabina Elementary School. The race will begin with a rifle volley performed by American Legion Post 49 from Wilmington. About 50 Marine recruits will participate in the race and run in cadence. Local veteran Bob Estel, 94, who served in the Pacific Theatre in World War II and was on Mount Suribachi when the flag was raised, plans to participate in the race and meet the Marine recruits. He will be pushed during the race by local veteran Shawn Carter. This subcommittee includes local runners: Judy Corgan, Barb Saville, Katie Croucher, Jessica Grimes and Stephanie Haines. The time for pre-registration has passed, but runners may register the day of the race beginning at 7:30 a.m. at Sabina Elementary School, located at 246 W. Washington St. The cost is $35. There is a $5 discount for veterans, and the price for students is $20. Non-runners may purchase the breakfast for $8. Runners will have the opportunity to receive swag bags and door prizes, there will also be music and awards will be given to the winners of each of the following age groups: 10 and under, 11 to 14, 15 to 19, 20 to 29, 30 to 39, 40 to 49, 50 to 59, 60 and over. There will also be a prize for top overall male and female runner. The current record holders are James Cochenour from the 2011 race with a time of 18:01, and Makki Kreager from the 2012 race with a time of 20:56. There will also be a contest for the most patriotic outfit.